Filter by Standard Account Format Founders Pack Deluxe Ed. Limited Ed. 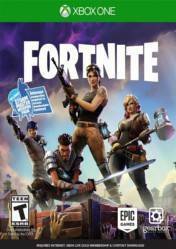 Fortnite for Xbox One is a cooperative survival game between a team of warriors with all abilities, who must try at all costs to stop the waves of zombies that lurk. To emerge victorious from this dangerous mission, we will use our ingenuity in the construction of all kinds of fortifications, as well as in the manufacture of weapons. As we overcome the waves of monsters, we will collect materials that we will use to create our fortifications, in which we will increase security measures by implementing all kinds of traps and zone defenses. The constructions that we make will be totally formable, that is to say, we will be able to edit each wall to fortify it, to put a window from where to shoot, to create high battlements like castle and to shoot from above, to place all type of explosive traps to brake to the legions of Zombies and in short, a huge amount of possibilities that guarantee us a virtually unlimited gameplay. The game has a high replayability, as the terrains and maps are generated at random, as well as the armament we will get and the events that occur in each game, which increases even more diversity and game modes. The game includes four different classes with various abilities: Soldier, Outlander, Ninja and Builder, each with unique abilities and customizations. There are no comments yet about Fortnite. You can be the first one!